With the Christmas holiday season you will think of the Peanuts character Charlie Brown and that little dishevelled Christmas tree, oh and of course Snoopy too. 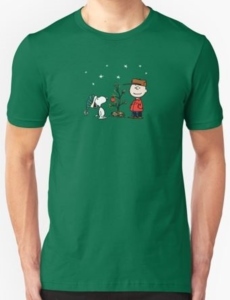 On this t-shirt you will find a scene from the classics Peanuts characters, find Charlie Brown and Snoopy both standing looking at the special Christmas tree in between them decorated with one red bulb. This unisex t-shirt is available in 17 different fun and cool colors to choose from and find it in a huge array of sizes that range from Small to 3XL. The perfect go to shirt as it is made to be soft and comfortable while durable to last you a long time. If you like Peanuts cartoons and hot chocolate then you have to check out this Peanuts Happiness Is Hot Chocolate Mug. The fun mug is made from durable ceramic and comes in 11 and 20 oz version and both are microwave and dishwasher safe. 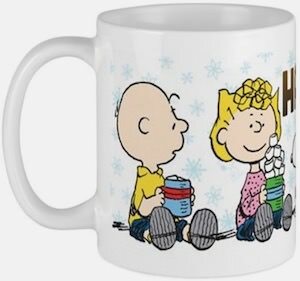 On the mug you can see some snowflakes in the background and then you can see Charlie and Sally Brown and Snoopy and all tree having a mug of hot chocolate in their hands with some marshmallows in it and then next to them you can see the text “Happiness Is Hot Chocolate” in big brown letters. Just click on the picture to see the whole Peanuts mug as it is adorable and fun. If you like Charlie Brown but don’t really like people then you just need to check out this Charlie Brown I’m allergic to people t-shirt. 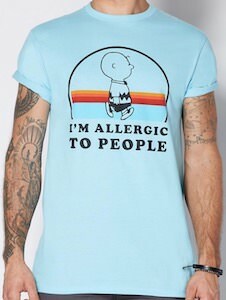 The light blue t-shirt shows a more classic Charlie Brown walking around and below the Peanuts super star it says “I’m allergic to people”. You can get this fun Peanuts t-shirt in men’s sizes Small – XL and is officially licensed. Now you just have to wear this fun t-shirt and maybe people will understand to stay out of your way because the shirt says that you are allergic to them so unless they brought an epipen for when you get an allergic reaction. If you like Peanuts cartoons and love to sleep then you should get a Charlie Brown comforter. 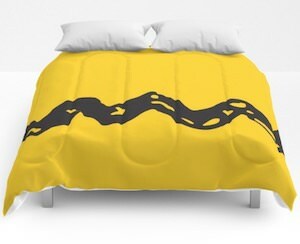 The comforter is available in most bed sizes from Twin – King and the back is white and the front is yellow with the black zigzag line just like on the Charlie Brown shirt. So you can dream about Charlie Brown and Snoopy having crazy adventures by simply sleeping under this amazing costume comforter. A comforter like this just fun to have on your bed as it just looks so colorful and I think it will look stunning on almost any bed and everyone will know what this comforter is all about. 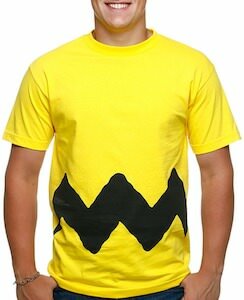 If you always wanted to be Charlie Brown then you should check out this Charlie Brown costume t-shirt. 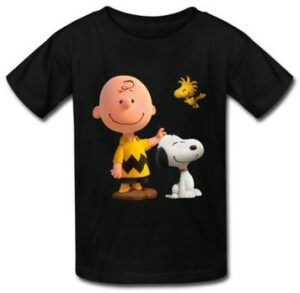 The men’s t-shirt is yellow and on the bottom side it has the zig zag black line and that makes this t-shirt just like the shirt the Peanuts star always wears and that make you look just like Charlie Brown. You can be wearing this amazing Charlie Brown t-shirt any day of the year and it even works as a Halloween or cosplay costume because by simply wearing this t-shirt you become Charlie Brown. The Peanuts yellow t-shirt is available in men’s sizes Small – 3XL for the perfect fit. The Peanuts stores still put a smile on those no matter what age they are. This time it is only for the little ones in your family to wear. 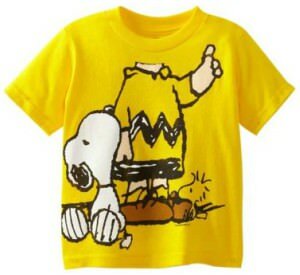 The Kids Charlie Brown, Snoopy and Woodstock t-shirt will be a big hit. 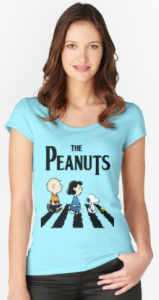 Right on the front of this t-shirt are three of the most famous of the Peanuts gang. Charlie Brown is in his typical yellow t-shirt with the black zig zag. 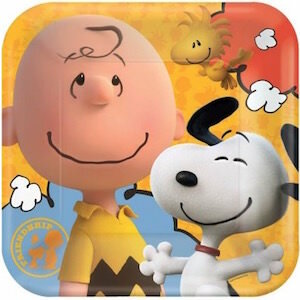 He is with his trusty dog Snoopy who has such a big smile. Last, but not least is Snoopy’s best friend Woodstock. He is flying above with a smile too. This kids t-shirt comes in sizes ranging from Small to XL and comes in six different colors. White, black, navy, pink, red and royal blue. It is made from 100% cotton, so you can relax, it will be durable and last until they grow out of it. It is unisex, so it can be for a girl or boy. If you wants a Peanuts party then these are the paper plates you need. These paper plates are themed after the Peanuts movie and show Charlie Brown, Snoopy and Woodstock and they all look real happy to be at your party. At 9 inch square these plates are the perfect size for cake, chips and many other foods and that all while looking fun. You will get 8 Peanuts party plates in a pack so that you have enough to have an awesome party with many of your friends. These Peanuts party supplies are a great start to get the party planning going. Charlie Brown has so many things to learn, and so does your little toddler running around the house. Now they can learn together with this Charlie Brown and friends t-shirt. The t-shirt is a bright yellow t-shirt featuring Charlie Brown minus his head, but don’t worry, as soon as your little one’s head goes through the neck hole. They become a little Charlie Brown. He is not alone on this t-shirt, he is with his best friends Woodstock and Snoopy. This fine t-shirt is made of 100% cotton and comes in sizes 2T, 3T and 4T. Perfect for that little “Peanut” that’s running around your house. Women love their football too, and no one better than Lucy van Pelt, except when it comes to Charlie Brown. She is always messing with Charlie Brown’s football kick offs. Poor Charlie. 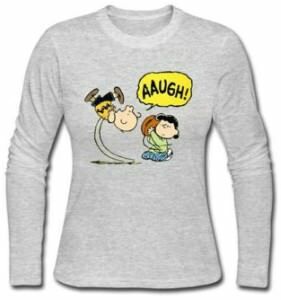 This long sleeve t-shirt features a graphic of Lucy pulling away the football as Charlie Brown tries to kick it with all his might. Charlie Brown is also yelling “AAUGH”. The sweater comes in 3 different colors to choose from, black, white and grey. The long sleeve shirt also comes in women’s sizes ranging from Small to 2XL. So it will be a great for all the Peanuts fans on your “must buy” list. The fun Peanuts characters are always up to something, this time they are mixing things up with the popular album cover “Abbey Road” from The Beatles. On the front of this women’s scoop neck t-shirt you see Woodstock, Snoopy, Lucy and Charlie Brown walking across the famous zebra crossing of Abbey Road and just like the Beatles album cover the title above them says “The Peanuts”. This is a women’s fitted t-shirt that features a large scoop neck and is available in a wide selection of sizes that range from XSmall to XL and choose from 7 fun, cool and vibrant colors.